In the semiconductor industry process shrinks are highly sought after. They result in smaller die sizes for the same part, which results in more chips per wafer, thus increasing revenue. There are other benefits (typically speed increases and power decreases (aside from leakage)) but from a purely economical stand point, the smaller dies result in more profits. Rarely do you get to SEE the result of these process changes. UV-EPROMs fortunately have a window, for erasing them with UV light, that also lets the die be seen. 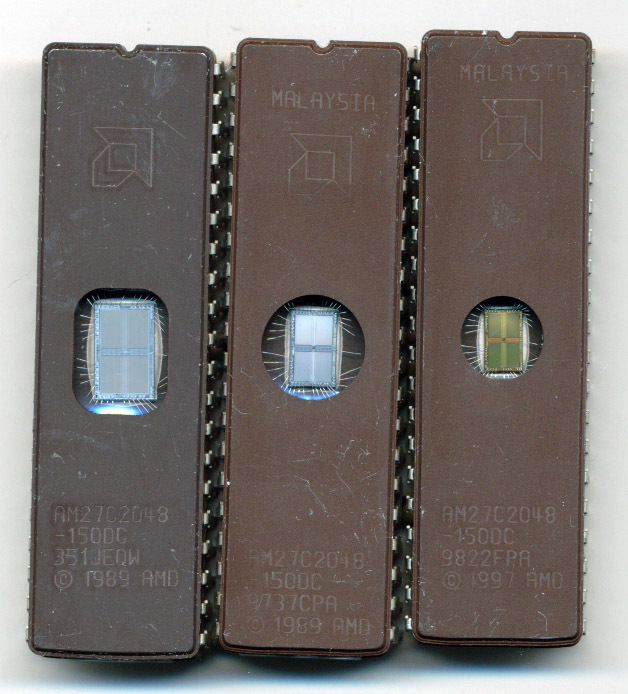 Here are three AMD AM27C2048 EPROMs. These are CMOS 2-Mbit EPROM, pretty common in the 1990s. As you can see that while they are all the same part, the dies are significantly different. While its hard to say for sure without a die analysis, we can make some good estimations based on what foundries AMD had at the time these devices were made. The first EPROM is date late 1993 which will likely be a 1 micron process. The second EPROM, dated mid 1997 is a bit smaller, around 20% smaller, which fits with AMD’s 0.8 micron fabs. The last, and latest, EPROM was made in 1998, likely at the joint AMD-Fujitsu (FASL) plant in Japan. This would mean it is a 0.5 micron device. The plant was transitioning to 0.35 micron at the time, but that was most likely used for the higher profit Flash memory devices. By 1998 EPROM’s were on the decline. Also of note is the different copyrights. The first two are copyright 1989 while the third is 1997. Its hard to know for sure (I do not have the microscopes/tools needed to do die analysis) but it is likely the 1 micron to 0.8 micron was an optical shrink. Literally this means that the die (and masks) are scaled down to a new smaller process with no architectural changes. This is simple and inexpensive. Sometimes changes will have to be made to support a new process, or make full use of its benefits, so a new layout/masks are made. This is likely the case with the 1997 copyrighted EPROM. The design was altered to work with the new, smaller process, and it was significant enough to warrant a new copyright. Bom dia, gostaria de saber quanto custa este CI EPRON: AM27C256-120DC.9525CPA.1986-AMD, valor moeda Real R$? para o brasil? peças 12 CIs.